The Simore DualSim Infinite IP is an intelligent adapter enabling you to install two SIM cards in one mobile phone. SIMore Dual SIM Infinite IP integrates our generation of IP Phone call feature allowing you to call abroad from your mobile Phone at very low cost through VoIP. This function requires the services of an operator who is a provider of VoIP via a local access number. When using the IP Call feature, SIMore send your connection parameter and ID (via DTMF) to your IP call provider to redirect your international call through their IP gateway. This feature allows you to call abroad at a low cost from your mobile and save up to 70% on all your international calls. When a call is IP, Simore connects first to your VoIP server, via a local access number, then the server connects you to the number you are calling. The Simore DualSim Infinite IP membrane is equipped with the "Bullet Injection" and the SIM cards software algorithms recognition technologies. This dual Sim card accessory enters into all phones, even those with an extremely thin SIM card slot such as the Apple iPhone, Nokia, Samsung, Blackberry, HTC and supports 4G, 3G and HSDPA networks. Simore Dual SIM Card Infinite IP settles directly into the slot of your SIM card. 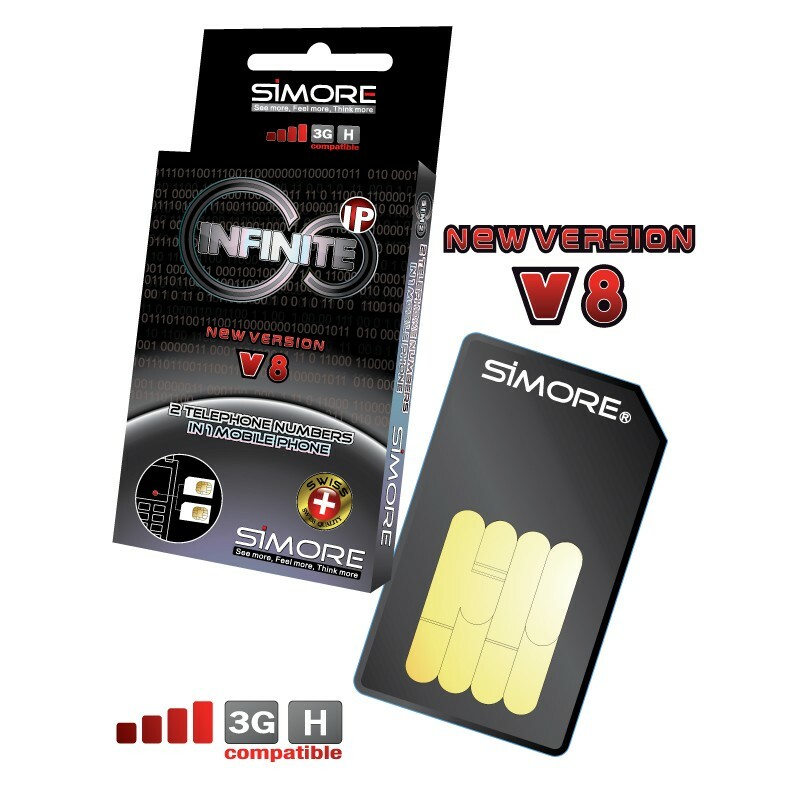 The Dual SIM card adapter Simore Infinite IP version requires the cutting of your SIM cards. Our system is reversible. We provide in every pack two recovery tools that enable you to restore your SIM cards to their original form and place each of them into two separate phones. Once inserted into your mobile, the Simore menu will automatically appear in the main menu of your phone. (You can also bring up the menu by dialling the Simore keyboard shortcut # 99). The Simore menu allows you to manage your two numbers and to define your settings. You can switch from one number to the other in two clicks. To call using the IP mode with Simore, the "IP call" procedure is fully automated. Choose the contact number in your phonebook. Accept the call by pressing the green button to launch the call function on your mobile. 100% of your calls are redirected to your VoIP server. Place an (*) before the number you wish to join. Simore recognizes the star placed in front of the number and automatically forwards the call to your VoIP server. Flexible printed circuit board technologies (Technology CoF). Operating systems like MacOS iPhone, Android, Symbian, Bada, RIM, Garnet, Access Linux platform, LiMo MeeGo, Mobilinux, WebOS...compatible.